Preheat oven to 450° F . Unroll piecrusts on a lightly floured surface. 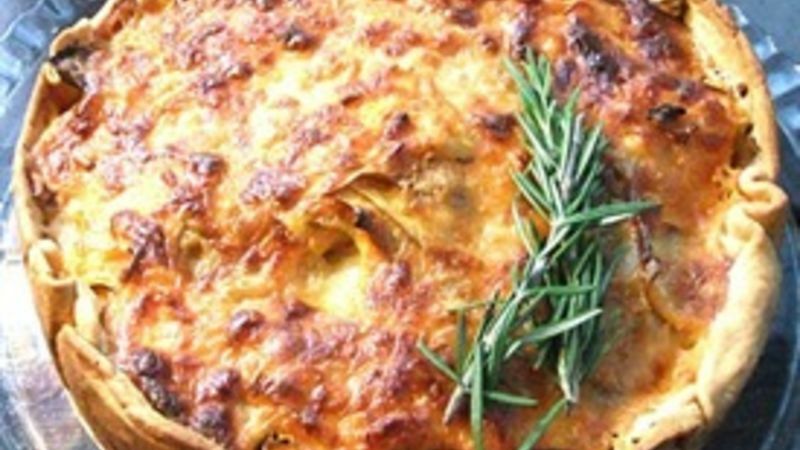 Sprinkle rosemary, pepper, and 1/2 cup cheese over 1 pie crust; top with remaining piecrust. Roll into a 13-inch circle. Press on bottom and up sides of a 9-inch springform pan; fold edges under. Chill. Meanwhile, peel and thinly slice Yukon gold and sweet potatoes. Layer one-third each of Yukon gold, sweet potatoes, and salt in prepared crust. Sprinkle with 1/4 cup cheese. Repeat layers twice, pressing layers down slightly to fit. Microwave cream and garlic in a 1-cup microwave-safe measuring cup at HIGH 45 seconds; pour over potato layers in pan. Sprinkle with remaining 3/4 cup cheese. Cover pan with heavy-duty aluminum foil. Place on a baking sheet. Bake at 450° F for 1 hour. Uncover and bake 25 minutes or until potatoes are done and crust is richly browned. Let stand 10 to 15 minutes. Carefully transfer to a serving plate, and remove sides of pan. If desired, carefully slide gratin off bottom of pan, using a long knife or narrow spatula. Garnish, if desired.